Holy Week actually begins on Sunday 14 April with Palm Sunday, and it ends on Sunday 21 April which is Easter Sunday. This is known in the Philippines as “Holy Week”, because this is an essentially Christian country and Easter is about the Christian faith and not about chocolate eggs and enthusiastic rabbits with baskets. Someone once described Easter as being like Grand Final time for Catholics! The actual HOLIDAY dates are as follows, and this means no Down Under Visa office during this time.You’ll need to survive without us. This isn’t Jeff being preachy. What your religious views are remains your own and I respect that, and if you decide to read no further it really is perfectly fine with me. This is, like all that I do on this BLOG page, meant to be educational and to help you to understand things. If you’re married in an Australian Filipina relationship it doesn’t hurt you to understand the things that are near and dear to her. Many a good husband goes to the Catholic Church twice a year with his wife….Christmas and Easter….and sits next to her. It makes her happy. And no one will pounce on you to try to convert you. It’s not the Catholic way at all, and speaking for myself I’ve never “converted” anyone in my life. And she won’t try to convert you either. If you act like a decent man to her and your kids, and if you don’t make fun of her for wanting to follow her own beliefs then you’ll find she will leave you very much in peace. You won’t be told not to drink alcohol, or be told what you can’t eat. She won’t be dipping heavily into your joint finances to hand it over to the Church. And you’ll be taken very good care of in ways that a wife takes care of her husband. I only have first-hand experience with Catholic Christians. You’ll also find a multitude of other religions including Jehovahs Witnesses, Seventh Day Adventists, Mormons, Baptists and Pentacostals and plenty of non-deominational churches where they just called themselves “born again”. There’s even a home-grown church known as Iglesia Ni Cristo. Some of these will only marry within their own, so be aware that you could run into some issues if you’re romantically involved with a non-Catholic. How religious is the average Filipino? Ahhhh yeah. Not an easy question. It sometimes depends on the family, and whether the family is especially devout. But it’s changed, and has done so a lot over the last 20 – 30 years. When I first came to the Philippines during the 90’s, shops were closed on Sundays. They used to read the Three O’Clock Prayer Time on the radio every day. Holy Week was intense. TV and radio were limited during this time, and from 3:00pm onward there was only religious programming. Good Friday, no TV or radio at all. And remember the People Power revolution of 1986? 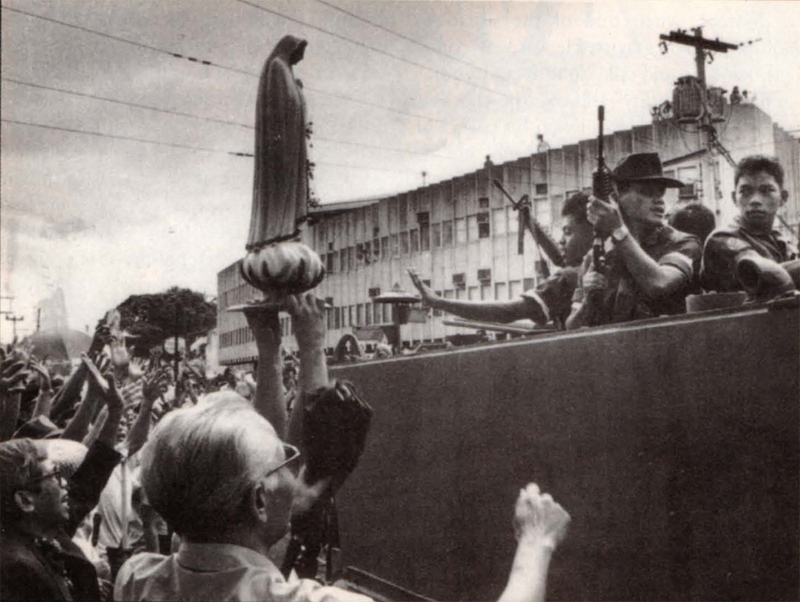 It was the remarkably-named Archbishop of Manila Cardinal Sin who called the faithful into the streets via his radio broadcast to protect then military chief Fidel Ramos and former Commender In Chief Juan Ponce Enrile who had rebelled against Marcos and were held up in Camp Crame. 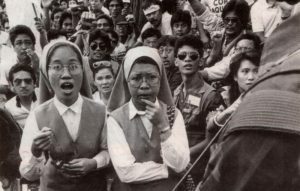 These protests were led by nuns, who would kneel in front of tanks to pray the Rosary. The faith of the troops were such that they defied their orders to shoot at the crowds, because they could not fire on nuns! They could never go home and face their mothers if they ever did such a thing! Many changed sides and joined the protestors. It was a non-violent revolution, in a very Gandhi style! Today? Not the same as those days. Yes, the kids will still receive religious instruction if they attend a religious school. Public schools have religious instruction. And I suppose most people you speak to will profess a Christian faith. However are they what they call “God-fearing”? Not really. There are plenty of single mothers, and the days of most girls saving themselves for their wedding night are largely over. The days of unmarried girls being accompanied by chaperones when their Aussie man arrives…I don’t think anyone does that anymore. In the 90’s and before? Most definitely! Church attendance? Still fairly strong, but less from younger people. But I have no idea if Three O’Clock Prayer Time still exists. Shops are open all the time, including Sundays and many are open during the whole of Holy Week. Why the decline in being religious? I would blame the internet largely, and the exposure to other values. Filipinas in the 90’s? The girls stayed at home helping mum. They asked permission to go anywhere. They would bring their cousins or sisters with them to keep an eye on each other, and would be back home on time when they were told to be home. Didn’t drink alcohol. Would never smoke. Danced with female cousins at the Barangay Fiesta. Certainly went to Mass every Sunday. And they were so naïve! Barely knew how babies were made! Then internet access came about in the late 90’s, becoming affordable in the 2000’s. Now everyone has everything on their smartphones, and therefore their mums, grandmothers, aunts and pious teachers are no longer the main source of influence of moral/spiritual guidance. Where it will end, I don’t know. But I still see plenty of decent women who still value marriage and fidelity and still largely hold Christian values whilst not necessarily the same enthusiastic religious practices that were the norm a few decades ago. Holy Week – What is it about? Again, meant as an education only. Choose to believe or don’t. Holy Week begins with the entry of Jesus into Jerusalem. He rode on a donkey and was welcomed by the people of the city who lay palm leaves in his pathway. This was a welcome of a king, and this threatened the temple authorities as well as the Romans. This is known as Palm Sunday for this symbolic reason. Thursday of Holy Week is known as Maundy Thursday or Holy Thursday, because this was the day that Jesus washed the feet of His disciples. Washing of feet was a task allotted to servants, and symbolizes that He came to serve mankind. Holy Thursday was also the day of the Last Supper. The Friday is known as Good Friday, as this is the day of the suffering of Christ and His crucifixion. Christians believe that His death was God allowing His Son to die for the sins of the world. Greater love has no one than this: to lay down one’s life for one’s friends. And Easter Sunday is the day of the resurrection, when Jesus rose from the dead to show that there may be life everlasting. The death and resurrection of Jesus is a central part of Christian faith, and it’s the belief and hope of all Christians that if we believe and if we follow the teachings of Jesus that there will be life after death for us too. Anything practical to know about Holy Week? Your lady may or may not be attending the Church during this week. If she’s moderately devout? She will attend the Easter Vigil on the Saturday. If she’s more so, she may be there on Palm Sunday, Holy Thursday, Good Friday and Easter Vigil. Maybe on Easter Sunday too. If she isn’t, then you’ll find a whole lot of others will be! And many go back to the provinces to spend Holy Week (or at least the holidays) with their families. That means hitting the road on Wednesday afternoon or evening and traveling to where they consider “home” to be. And it means heading back on the Sunday to be ready for work again on the Monday. So what that means is plenty of traffic. A bit like the Easter long weekend in Australia. It’s been a few years since I’ve been in Australia at that time, but I always remember the dreaded “Easter Road Toll” where they would keep reminding everyone of the number of deaths on the roads state by state. It served as a grim reminder of the folly of traveling in a screaming hurry over a limited number of days. Here, very much the same. Lots of people on the road traveling. Also lots of people out and about. So be aware of this! And again, be respectful of your lady’s faith! It may not be something you relate to personally, but successful marriages include a mutual respect for each others feelings. Making fun of her faith would be like her making fun of a beloved family member of yours. And consider that her faith may well be part of the reason why she’s such a caring and loving person and puts up with so much nonsense from you as my wife puts up with bucket loads from me!